With one week past since our first bout of 2013, it’s time to re-live the action and check out the stats with Head NSO Badger’s post-bout breakdown. We were super excited to present our first open home bout of the year, back at our home the Walker Dome. Panda Monium wielded the mic, keeping the crowd in high spirits and encouraging them to show their love for all the teams. Meanwhile, our resident photographer and Tyne and Fear member Zero G provided some awesome shots of the ladies on track. During the start of the bout the Hinnies score stayed just ahead of the Parma Violents and began to pull ahead as we neared half time. The Violents earned a 24 point power jam in the final jam of the half closing the gap to 101 – 85. Led by team Captain La Dolce Beater, the Hinnies continued to clock up the points, helped along with a 30 point jam by Moulin Bruise (the highest points awarded in a single jam!) bringing a final score of Whippin’ Hinnies 225 – 154 Parma Violents. The highest average points per jam was 12.38 achieved by Moulin Bruise for the Hinnies, and 8.40 by Maxx Attaxx for the visitors. There were a total of 46 penalties between the two teams with Hinnies picking up 26 majors and Parma Violents 20 majors. The most common penalties picked up by the Hinnies were low blocks, and for the Parma Violents, multi-player blocks. Sin Bin Saints were Theasaurus Wrecks, Dizzy Bizzy and Cookie Monstrous for the Hinnies, and Jo Anarchy, Wiggy Stardust and Lila DeThrash for the Parma Violents, with no visits to the sin bin. Our headlinine bout of the day saw the return bout between the Canny Belters and Hellfire Harlots. The teams last met in February 2012, when the Harlots took home the victory with a final score of 160 – 100. The predicted score for today was Canny Belters 100 – 390 Hellfire Harlots. After a positive start to the bout with a powerjam and Kalamity James earning the team 15 points, things started to slip away from the Belters. The first half saw us give away 5 power jams to the Harlots due to penalties, accounting for a whopping 110 points against us. The final score at the end of the first half was Canny Belters 18 – 162 Hellfire Harlots. In the first jam of the second half we got our second powerjam of the day which saw Guinefear scoring 20 points – more than doubling the Belters’ score! And here began the start of the Belters’ turnaround, and an epic effort to claw back those points. We achieved lead jammer for 38% of jams in the second half, compared to only 18% in the first half, thanks largely to blammer Kalamity James who went on to be awarded Best Jammer. Other awards went to Missy Pow Pow for Best Blocker, and Sniper Viper, who made her return to the Belters today after some time away for injury, picked up MVP! 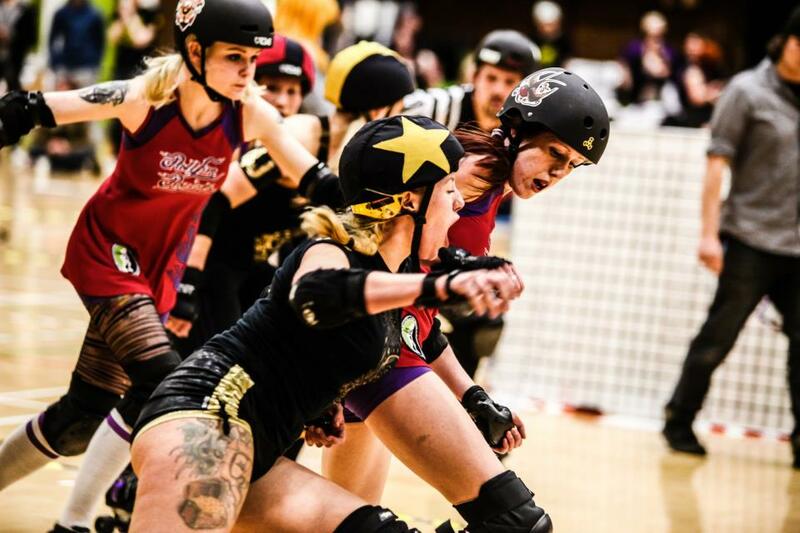 The second half saw a score of Belters 72 – 90 Harlots, bringing the final score to Canny Belters 90 – 252 Hellfire Harlots. Although the Belters weren’t able to hit the 100 points they were predicted to score, they were able to keep Hellfire to well below what the rankings had suggested. This means that the Canny Belters will move up 7 places in the rankings to #40, and Hellfire Harlots will remain at #17. The highest points awarded in a single jam was 25 earned by both Terroryaki Smak and Harlots Team Captain El Viscious during the first half. The highest average points per jam was 9.09 achieved by El Viscious, and for the Belters 3.08 by Guinefear. The Penalties were rather unbalanced, with the Belters picking up 24 majors and Harlots 16 majors. The most common penalty picked up by both teams was cutting track. Sin Bin Saints were Brie Larceny, Sniper Viper and Anita B Nasty for the Belters, and Coco De Maul, Finn Furious, El Kapone, El Visious, Dr C Nister, May K Fist, Falcon Rouge and Kill’er Instinct for the Harlots, with no trips to the penalty box.